When I saw this EGT game, especially as it contains the word 'Hot' I must admit I let out a little sigh, "Oh not another featureless stacked fruits slot!". 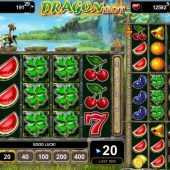 Dragon Hot though does actually differ from the usual format of low-tech gaming with no feature(s) not by much but enough to make it a tad more interesting. Sure, we still see the stacked fruits, scatters that don't award a bonus and the obligatory trotting noises when you spin the reels but they've borrowed a little trick from the WMS 'Colossal Reels' games such as KISS and more specifically Gems Gems Gems as we will see. So will this game enhance your bankroll or end up Dragon it down? Immediately one will notice the fact that there are 3 extra sets of reels to the right of the main set. You pay 20 coins to play and this includes all 4 reel sets at 5 lines per game. All the sets have a 5x3 format and lie over a picturesque countryside scene and three rather pathetic-looking cartoon Flying Dragons sit above the centre 3 reels for a purpose that soon becomes apparent. All the icons can appear fully stacked bar the scatters and Red 7's will award you 150x bet for a 5-of-a-kind win. Grapes or Melons pay 25x, Bells 10x and Cherries, Lemons, Plums and Oranges 5x for the full line of 5. In fact the symbols and pays are pretty much an exact replica of the EGT 40 Super Hot slot. As with that game you see a Star scatter on reels 1, 3 and 5 for a one-off 5x bet hit and Golden $ on all reels paying up to 25x bet for all 5 on any one grid. These appear on reels 2, 3 and 4 and expand. You may have spotted my mention of the WMS slots above and this is where we see their Replicating Wilds system. Any Wild appearing on the main grid expands and then the Dragon above its reel flies it off to to the relevant reel on top of the other 3 reel sets and it then expands down all 3 of them, possibly forming wins on those too. If all 3 Wilds appear this will almost certainly result in a substantial win on all 4 grids.